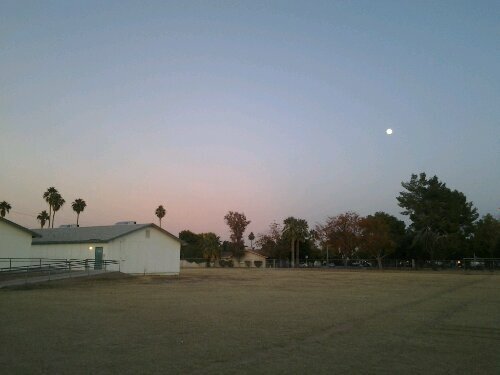 I begin our survey of Tempe parks at my alma mater, Carminati Elementary and its adjacent public play space, Joyce Park. The landscape of Joyce- separated by a chain-link fence from the school yard- is merely an extension of the school grounds as considered for this assessment, and is noteworthy for its generous spread of trees, picnic benches, and central round, sand playground. For now, though, we will turn our attention to the dynamic features on the public school side of the fence. The schoolyard fencing creates an insulated safe environment to play in. 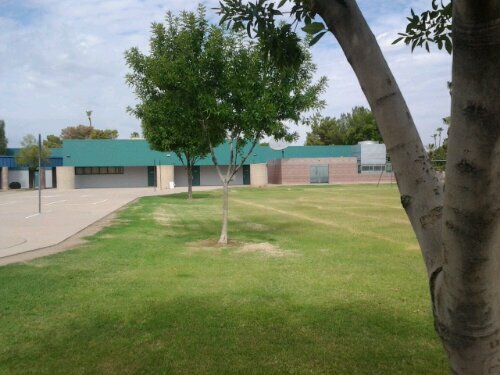 With one gate in or out (the other, closer to the school, is usually locked after hours) there is relatively little traffic walking through providing uninterrupted space to stretch out. Where children are involved this keeps them from the roadway and also from unwelcome passersby; I hate “stranger danger”, but it is a real cause for concern for parents. Within this enclosure you can relax your way-too-intense parental supervision and let the toddlers toddle freely. As for topography, there is none, save the burms leading up to the slightly elevated portable buildings next to the soccer field. I run up and over the railing on the top like a steeple hurdler. So, with the exception of this modest mound, the ground is a flatline. Comprising the school yard is a short, elementary-size soccer field, 6-rim basketball court (ParkCourt!) 50 meter mini-track with complimentary long-jump pit, three backstops AND two sand playgrounds with an abundance of chutes and ladders and creative options for strength training. It’s a well-rounded space for a variety of activity. The generous spread of recreation invites a healthy flock of basketballers, children (and adult!) jungle-gymnastics, and leisurely swinging. (Not to mention the rarely-seen paraglider hoisting the massive sails for his dress-rehearsal). For what I practice AND preach, so far as a “Parque pROGUEram“ or “WOD“ is concerned, this arrangement is the ideal schema for sport and fitness recreation. It offers a compressed exercise environment with enough openness to breathe and be elevated. And then we inventorize our other amenities and utilities, which are minimal. There is a three-way (dog-accessible) water fountain on the Joyce side. Carminati’s fountains are turned off after hours and the bathrooms are locked. Both sand playgrounds on the school side are covered by blue tarping, the one on Joyce side is newly covered as well. 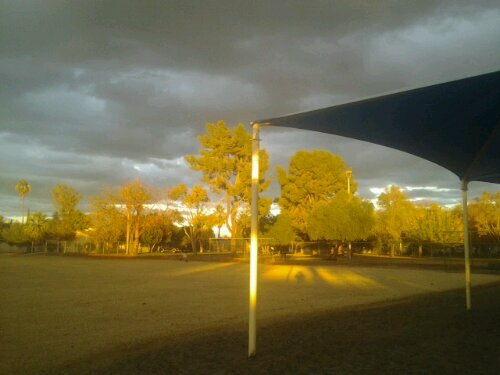 This concludes our Park Assessment for this play space just north of the US-60, west of Rural Road. I’ll stake this proudly as my home turf, my neck of the hoods, my court, my trees and MY home-field advantage. This was the park I looked out on from my childhood home on Hermosa. This brings things full circle, back to my youthful origins, playing for days full of soccer and tackle football, chasing lizards, climbing trees (breaking arms :|), flying kites…whiling the days away, lazy as a cirrus cloud. Ah, time flies, doesn’t it?